Wow, I had no idea I had so many readers in Portland! I will definitely have to arrange a little meet-up. I'm ridiculously excited to go. The time is going to pass so slowly between now and March! The weather was so crappy outside today. We were expecting heavy thunderstorms all day, starting at around 10:00 am, so I wanted to get my long run done right after getting the kids on the bus. I had nine miles on the schedule today. Because of the impending storms, I decided to stick close to home and do three 3-mile routes just in case I had to get home quickly. 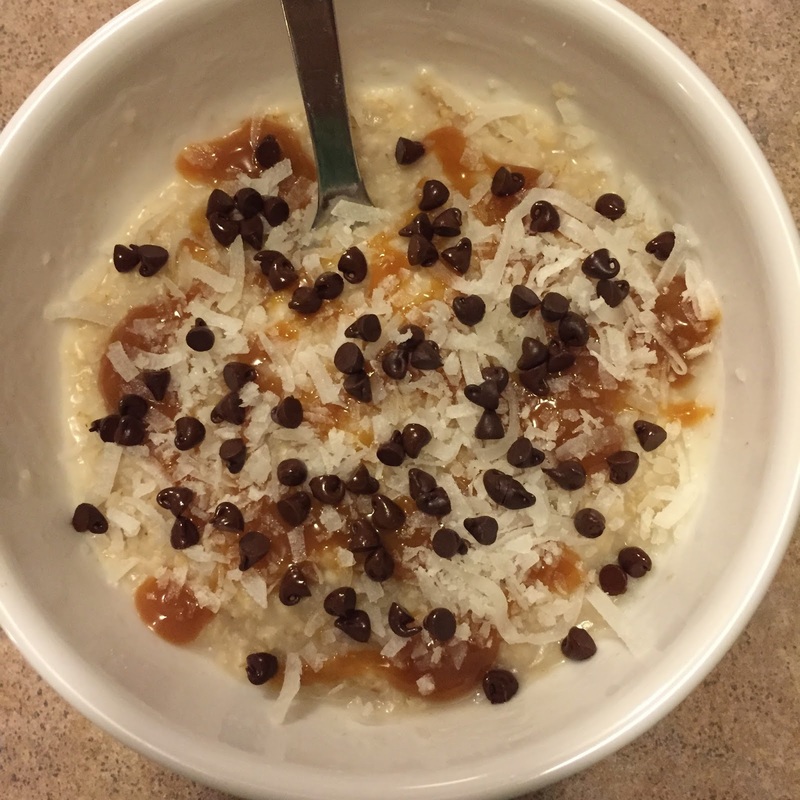 I made an old favorite for breakfast: oatmeal with caramel, chocolate chips, and coconut (6 PointsPlus). It's a good breakfast before a long run! It was pretty warm and humid out, so I wore capris and a tank, and I put my phone in a ziploc baggie inside my Flipbelt. I headed out for the run, and I could tell right away that it was going to be a tough one. The wind was crazy--14 mph with gusts of 25 mph. I had planned to run sub-10's, but when I had a strong headwind, I just decided not to worry about my pace at all, because I was using up too much energy in the wind. At around mile 2, it started to rain--hard. I really wanted to finish the run, so I decided to keep going, and just prayed that my shoes and socks didn't get soaked. I was on the second three-mile loop when my feet started feeling wet. The rain came down harder, to where I really couldn't even keep my eyes open (I couldn't find my visor before leaving the house, and it would have been really helpful today!). At mile 3.25, I just turned around and headed back. There was no way I wanted to run with soaked feet, and it had just started lightening. So, I just decided that I would consider this a step-back week (reduced mileage), and call it a day. I took a shower, and then was pretty lazy for the rest of the morning. It's hard to get motivated to do anything in this kind of weather. Last night, Jerry and I made Caesar salad with rotisserie chicken for dinner (mainly because I didn't feel like cooking, and the Caesar dressing was on Manager's Special). We had leftover stuff in the fridge, so I made it for lunch, too. Normally, I'm not a salad person, but once in a while I really like them! 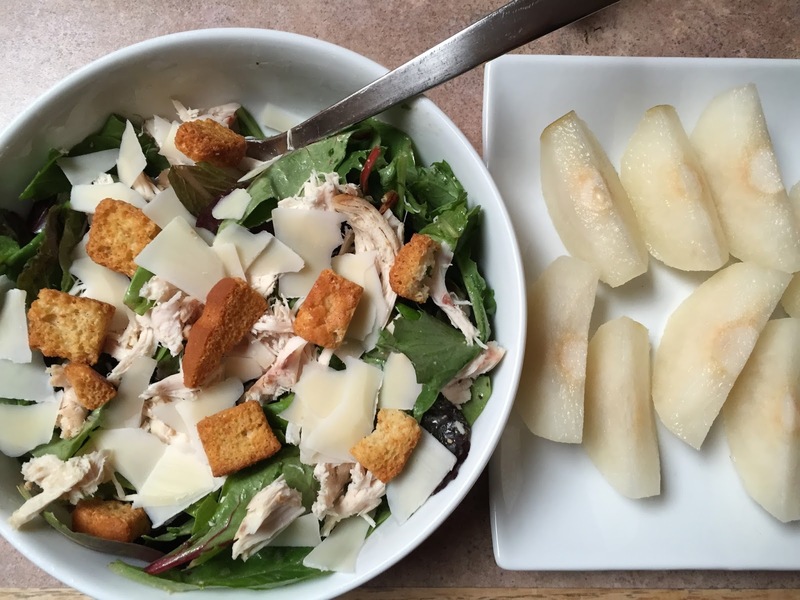 I had another old favorite on the side--an Asian pear. Those things are heavenly. After lunch, the weather was pretty clear. We were supposed to have thunderstorms all day, but the sky didn't look like it was going to rain again. I thought, "I should just go finish my long run..." and I decided to go ahead and do it. 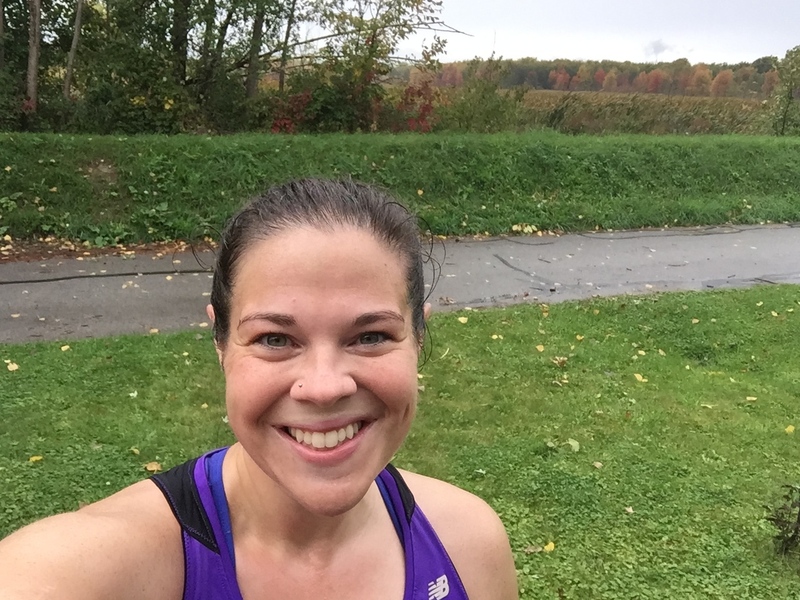 I would have felt guilty all weekend for not doing a long run, so even though I was showered and dressed, I put on another set of running clothes and headed out for another five miles. I stopped at my parents' house at around 2/3 of a mile in. My brother and his wife had just gotten in from Minnesota, so I wanted to say hello to them. I was there just long enough to watch the Tigers get two home runs in a row! Then I headed out again. I was feeling a little better this time, but as soon as I turned into the wind, I was nearly blown off my feet. Running next to the lake was really windy! At around mile three (or seven, if you count the first run), it was like the sky just opened up all of a sudden and dropped a huge bucket of water on me. The rain was a downpour, and the wind was so strong that the rain was going sideways (it reminded me of that scene from Forrest Gump). I've never been scared of weather while out on a run before, but for about half a mile today, I was actually worried that there would be a tornado. The wind was SO strong. I wanted to stop and take a picture or video to show it, but I didn't want my phone to get ruined by taking it out of the bag. There was a really loud noise and I thought it was a low-flying plane at first, but I realized it was just the wind. I started to think about what I would do if there actually was a tornado, and then just as quickly as it started, the rain fell to a light drizzle. It had only lasted about five minutes, but it was really bad. I decided that I was going to finish this run, no matter what, so I pushed on. My legs were really tired, but I was really determined to get through it. Finally got back home! I couldn't wait to shower (again) and put on some dry clothes (again). See how pretty the trees in the far background are getting with the color change? I was really hungry after the run, so I made a green smoothie for just 2 PointsPlus: 1 cup almond milk, 1 frozen banana, a handful of spinach, 1 Tbsp. of flaxseed, and 6 ice cubes. I hadn't made one of these in a long time! 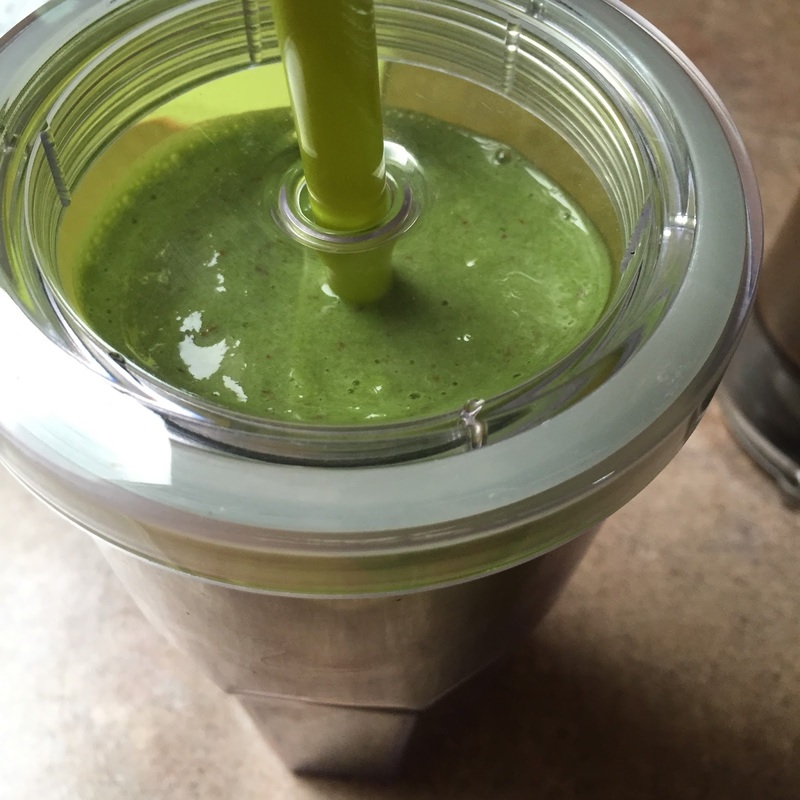 I put too much spinach in it, because I could really taste it, but I still liked it. For dinner, I made turkey meatloaf, mashed potatoes, and roasted cauliflower--comfort food! It was such a crappy day outside that it seemed perfect to make a comfort food meal. (Forgot to take a picture, naturally.) Tonight, I'm going to have a glass of wine and a Weight Watchers peanut butter brownie. Those brownies are so good! They're only about two bites big, and they're 2 PointsPlus, but they're certainly worth it. Wow, what an adventure you had today! We are in the middle of an extreme heat wave which makes me glad I have a gym membership. Mind if I ask, how many activity points did you earn and do you use them? I earned 18 for those 9 miles. I always eat all of my points available for the week, just not always on the same day I earn them. So I eat 26 PP per day + all my activity + all my weekly points each week. We had that rain a couple days ago here in Nebraska. But we also had the awful wind today. Your determination when running just amazes me!! That's such a fun incentive, Emma! Love that idea. I really like running in the rain. I know, weird. Wind though....no. okay your oatmeal is looking so good I am going to have to make that! Yummmy!